This is an extraordinary painting. On 30th January, 1965, after a state funeral at St. Paul's, Sir Winston Churchill's funeral cortege began the journey to the Oxfordshire churchyard, where he was buried. At Tower Bridge Pier, the cortege was piped aboard the launch Havengore. It then travelled westwards, up the River Thames, to Waterloo, where the locomotive, Winston Churchill, was waiting, to carry the great man on the last lap of his journey. In Gross's painting, we see the crowds gathered on London Bridge (the old Bridge, sold to Arizona, replaced 1973) and behind them, on the South Bank, Southwark Cathedral (the oldest cathedral church in London). Ahead, we glimpse Hay's and Chamberlain's Wharfs, with the freighter, Stella Marina; this stretch of the Pool of London was named the, 'Larder of London' and, in the early 1960s, its cranes dominated the South Bank. As the Havengore passes beneath London Bridge, the cranes dip in graceful acknowledgement. The following clip includes film of this scene. 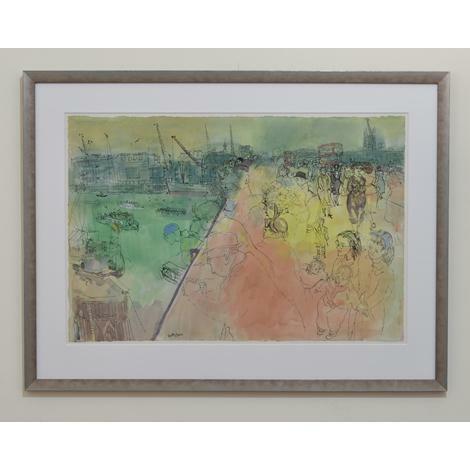 Gross captures the mood of this eventful day, slicing the picture in two with the line of the Bridge, casting a sombre, green-indigo wash over the Thames and a translucent red & yellow over the crowds. Curiosity, grief and contemplation - as well as lack of interest, as some get on with their busy lives - are all imparted by the deft lines which conjure faces, hats, gait and habit of the individuals who make up this crush of people. There could hardly be a more poignant and iconic painting in Gross's oeuvre. This picture was found in a private collection in Canada, and cleaned and restored for Grant Waters (collector, dealer and author of Dictionary of British Artists, working 1900-1950, 1975).